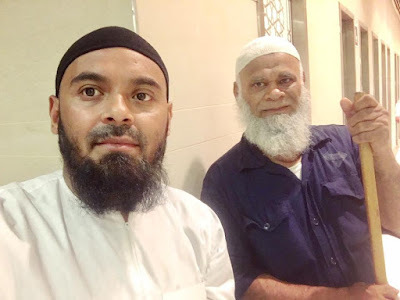 It's a huge challenge cleaning the world's biggest Mosque and each days thousands of dedicated cleaners like Muhammad, the Burmese Rohingya gentleman beside me are employed to work round the clock to maintain the cleanliness of the holy Mosque. - Sweeping and mopping floors. - Polishing the minarets, handles, tiles, gates, stairwells, bridges and doors. - Cleaning toilets, ablution basins, sinks, baths, and drinking fountains with cleaning detergents 5 times a day. The toilets themselves have approximately 20,000 visitors a day and cleaners are stationed continuously to clean and maintain hygiene in the general WC areas. - Picking up tonnes of dropped and discarded litter. - The Mataf (area around the Ka'bah) is washed using hi tech equipment. - Last but not least, 30,000 bespoke rugs undergo a 5 step cleaning process 3 times a day, which involves dusting, washing, drying in sunlight and mending. To give you the reader a general idea, the estimated cleaning surface on a daily basis measures approximately 1 million square metres, and will extend to 1.8 million square metres after the completion of the extension project. Just like the street sweeps the toilet cleaners are amongst the lowest paid and many are in huge debt after having paid the equivalent of 7-10 thousand pounds to secure paid work in Saudi Arabia. They are not paid sick leave and the only benefit available is free accommodation. Despite this the cost of daily living means little is saved to support their families. A typical shift for these guys lasts 10-15 hours of non stop cleaning duties with small breaks for food and prayer. They are a contented lot and I enjoy observing them in a semi quiet spot, resting, smiling or consuming their food with their colleagues. It's nice to see them relaxed for a little while. Again, despite their circumstances they are a really friendly bunch who are proud of the role they play in welcoming the world to Makkah, and dare I say it - they are ambassadors for Saudi Arabia for they mix closely with the millions of visitors at first hand and this interaction helps form a rather positive image in the mind of the visitor. In fact the Saudi authorities should up their wages based on this free PR alone. Again, I can't stress how important it is to offer a tip and the best way to do so is change your designated amount into 1 Riyals and then distribute as you see fit as you wander the Haram complex. If you can't get change at the shop or the bank staff are ignoring you in their customary way then ask the beneficiaries directly - They'll have change from tips or will club round quickly and stump up the amount you require. They are very needy but also proud and upstanding and the generosity of visitors goes a long way towards supplementing their meagre wages.